You really can't beat a Saturday night curry and this one was fantastic. Actually I'm loving all curries at the moment and could quite honestly eat them every night! Luckily my boys are all as keen as me and this one was especially well received. My 3 year old gobbled his down in what seemed like 5 minutes. My 20 month old was not so keen but that's mainly because he's developed a fear of his high chair and screams bloody murder every time we try to put him in it. Mealtimes have not been pleasant for the last few days and I'm dreading going out for dinner this week because of it! The recipe below is for a double batch because I wanted the leftovers for the following night and a serve for hubby's lunch during the week. You could of course halve it for a standard 4 serve meal. Rinse the lentils well under running water and discard any discoloured ones. Place the lentils, ginger, bay leaves and tomatoes in a large saucepan. Cover with 6 cups of water. Bring to the boil then reduce heat to medium and simmer for 10-15 minutes or until lentils are soft. Discard the bay leaves. While the lentils are simmering, melt the butter in a frypan. Add the onion and fry for 3 minutes. Add the garlic, turmeric, cumin, coriander, cinnamon, garam masala and chilli and cook for another minute or so until the spices and fragrant. Add the lemon juice, mix well and then pour the mixture over the lentils. Increase the heat and boil for a few minutes or until the sauce has thickened, stirring often to prevent it sticking on the bottom. Remove from the heat and stir in the coriander. Top with a dollop of plain yoghurt and serve with brown rice or naan bread. This sounds lovely,a great combination of spices.I love a good curry too, my children are not so keen though! I have stopped by from Veggie Mama Meatless Monday. Thanks for stopping by Kyrstie! Yum! My little boy (age 7) also enjoys lentils. We use this recipe, which is similar to yours but with carrots and somewhat simpler spices. When the kids love it it usually means you're on a winner! We're slowing getting Charlie back in his high chair but he's still not keen and seems really uncomfortable. Thanks for the tip about getting him to kneel, we'll have to give it a go. The boys do have their own little table where they sit for snacks and drawing but I really want us all to eat dinner together! Hi, I'm dropping by via Meatless Mondays. 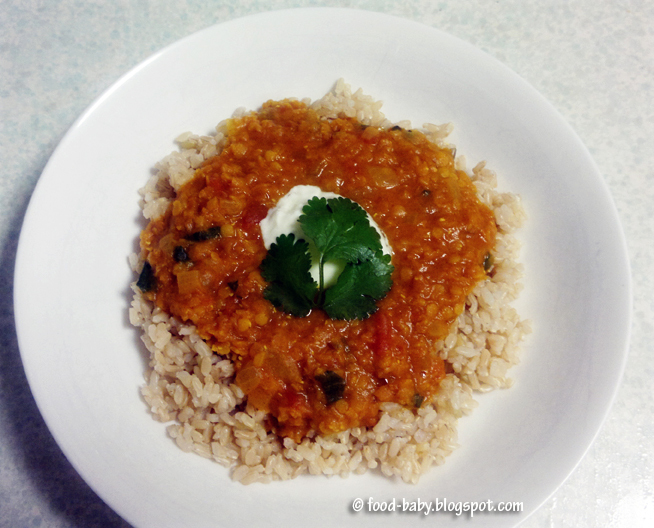 I really do love lentils and use it pretty often in soups, but have not tried to make dhal. Thanks for making it look so simple that even I could do it. Crepes for Bastille Day and a blogiversary!